Home » Mobility » Wheelchairs for Narrow Doorways: Save Your Walls and Woodwork! One of the frustrating parts of having a wheelchair is that it can be too wide to move around your own home. Many older houses have small, narrow doorways that just will not accommodate the large size of some wheelchairs. So, here are some wheelchairs for narrow doorways that might just fit better through small doors and small houses! Keep reading to learn how to choose a wheelchair that is smaller and narrower than some others. Of course, you also need the wheelchair to fit the user too! I’ll show you how to find that delicate balance. The width of a wheelchair’s seat affects the total width of a wheelchair more than anything else! It is important to understand the difference between these two measurements because it can get a little (or a lot) confusing. Here is the scenario. You are looking for wheelchairs and you see descriptions and sizes like 16″ or 18″. So, that means the chair is only 18″ wide, right? WRONG! That measurement refers to the seat width – the area where the user sits in the wheelchair. It is not the total width of the wheelchair itself. The overall width of a standard wheelchair is usually 6″ to 8″ wider than the seat width. Why is this? Because of the wheels, hand rims, and armrests. On a standard wheelchair, these items stick out from the side of the wheelchair and increase how wide it is overall. You’ll have to dig a little deeper in the specs to find the overall or total width. I have a chart down below that shows you the overall width of several popular wheelchairs. However, transport chairs are a little different. They don’t follow that rule. Comparing the same seat widths, transport wheelchairs are narrower than standard manual wheelchairs. But, they aren’t right for every situation. The wheels of this type of wheelchair are underneath the seat because they are smaller. So, the wheels do not add much to the overall width of the chair. Plus, there are no hand rims on these chairs either. But, this means the user will not be able to push themselves in a transport wheelchair. Someone will have to push them from location to location. This is why transport wheelchairs are generally narrower than standard wheelchairs when comparing sizes. Generally, there are a few other features you should always look for when shopping for a wheelchair of any size. This safety feature is incredibly important and most wheelchairs come with it already. The wheels locks of your wheelchair should be easy to use and apply to prevent rolling away on any uneven surface. These should also be easily accessible to the person in the wheelchair or the person pushing them. This is a less common safety feature but can still be useful for people in wheelchairs to add peace of mind. A seatbelt will keep them securely in place no matter what the condition, giving them added stability and security in their wheelchair. Surprisingly, many wheelchairs do not come with seatbelts so you may have to order it as an accessory. People in wheelchairs will spend most of the day in one, so it had better be comfortable, right? Ensure that you’ll be as comfortable as possible with padding on all areas of the wheelchair that your body will be touching, namely the seat, backrest, and armrests. Some leg rests even have padding as an added bonus. Along those lines, swing-away arms and leg rests will give you added versatility and a sense of control and independence as well. Adjustable arms are useful for eating, adjusting for different comfort levels, and for navigating through tight spaces. Sometimes, it may be necessary to remove the arms to get though a really tight space. Bathroom doors are often the narrowest doorway in most homes and can be anightmare for some wheelchair users. Some of these hacks may be helpful so that you can keep using the wheelchair you already have. Sometimes, there are changes you can make to the doorway that don’t require construction to get a few extra inches of width. I am often in homes where the door has actually been removed from the doorway. The drawback here though is a lack of privacy especially in the bathroom. The trim and jamb of a door take up about 2″ to 3″ of a doorway’s width. Removing the trim and jamb can increase the overall width of a doorway by this much. Of course, this isn’t going to look great. You will have exposed 2×4’s and rough wood. None of the above tricks are wonderful options. But they do work. 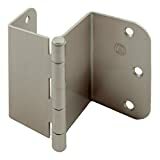 Here is another trick I tell my patients about all the time: offset hinges! You see, when a door is open, the edge of the door sticks out into the doorway. This takes up 1-1/2″ to 2″ of your overall doorway width. So, you actually loose space when the door is open. This is why you shouldn’t measure a doorway with the door closed. You can find these at your local home improvement store or Amazon has them too in a wide variety of colors and styles to match your existing home design. Here are some of the best wheelchairs on the market that are also narrow enough to fit the small doorways in most homes. Of course, they have many, if not all, of the recommended features mentioned above too! Easy to fold and unfold narrow transport chair that is only 22" wide. Narrow standard wheelchair that the user can propel themself in using the handrims. Best of both worlds. 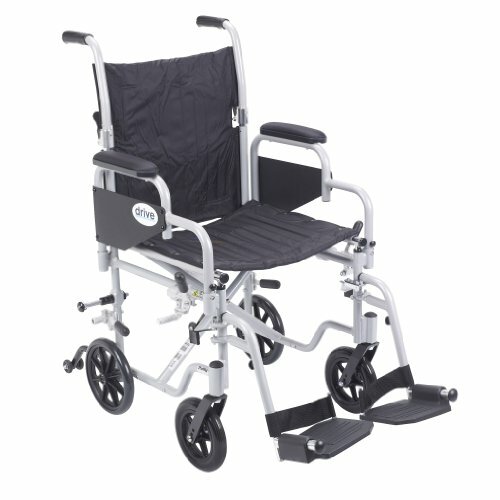 This is a narrow transport chair that comes with large wheels that pop on and off quickly! This is a lightweight option for a narrow wheelchair with extra features like flip back arms. This is an Amazon bestseller and for good reason. It’s very narrow, coming in at about 22” wide overall with a 19″ wide seat. So, it should go through most of those tight doorways unless you have one of the real small 20″ bathroom doors. It also has cushioned armrests and swing away footrests. The steel frame provides durability and structure, and the seat is made out of nylon upholstery for easy cleaning. There are a few drawbacks to this model. First, the arms are not adjustable and also not removable. So, they can not be taken off for folding or for transfers in and out of the chair. Also, this is a transport chair so it cannot be propelled by the user so someone must push it for them. This alternative Drive Medical wheelchair is another option for your narrow doorway navigation purposes, although it’s a bit pricier than the option above. But, it is a standard manual wheelchair and the user can move it themselves by using the handrim. The arms are detachable on this model, and also has the swing away legs as well. 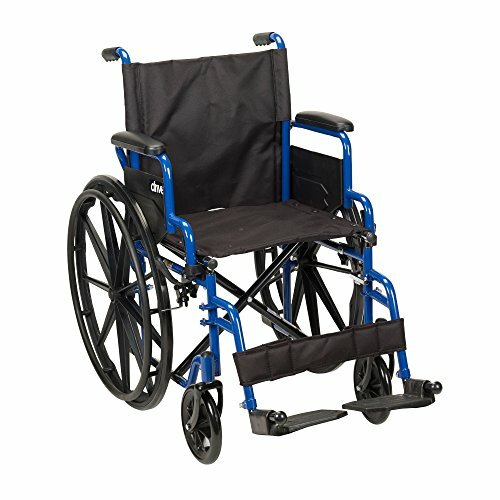 The seat of this wheelchair is also cushioned and the wheel tires have an easy push-to-lock function. This wheelchair also features calf straps to keep the user’s feet safely on the footrests. This chair also comes in a variation that has an 18″ wide seat and is 24″ wide overall. Total weight capacity of 250 lbs. Learn More about the Drive Medical Blue Streak at Amazon. For those of you who are having trouble deciding between the two above, check out this model. It really is the best of both worlds. And here is why. This chair is a combination transport chair and standard wheelchair. It has the usual 4 small wheels of any transport wheelchair. But, it also comes with 24″ wheels with handrims that pop on and off the wheelchair in seconds with a quick release button on the axle! So, you can have the narrow transport chair (22-1/8″ wide) when you need it AND the user can push it by themselves when you aren’t as concerned about the width (23.5″ wide) by adding on the bigger wheels. This chair has other great features too. First, it folds up very easily and even the back folds down so you can load it into about any car. Anti-tippers that keep it from tipping over backward are also included. Last, it comes with easy to clean nylon upholstery and swingaway footrests. The Poly Fly also comes in 18″ and 20″ seat widths too. The weight limit of this chair caps out at 250 lbs. See What Users of the Poly Fly Have to Say at Amazon. 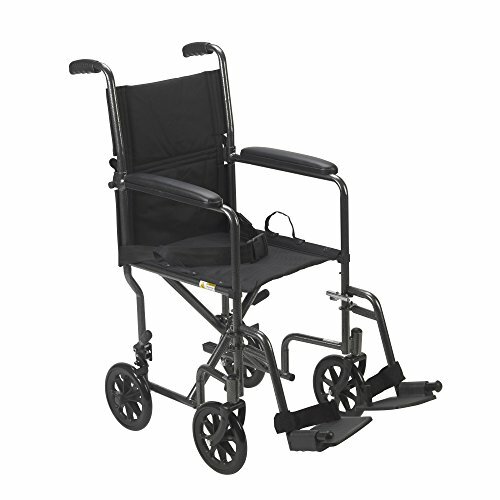 Medline also makes quality wheelchairs and the edge this one has over others is that the arms flip back instead of just detaching. This is a slight difference but it can make a big difference in terms of ease of use depending on how the user transfers in and out. The person in the wheelchair can usually do this themselves which gives them independence and control over their comfort. They can also bring them back whenever they want without someone having to go get them(as one would do with detachable arms). The leg rests are also detachable and swing-away, letting you choose what works best for you. Other than that, this wheelchair has a higher weight capacity than the others (300lb capacity), This is a great choice for a larger person who really wants that narrow mobility. It is also available in 18″ and 20″ seat widths if you need a wider seat. But, remember, the overall width will increase too! Read User Reviews of This Narrow Wheelchair at Amazon. 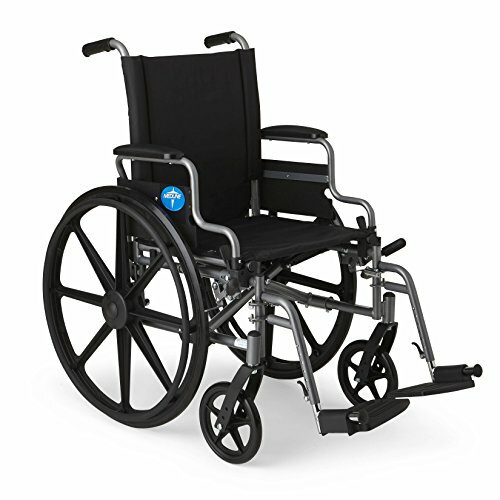 Finally, this Medline wheelchair is similar to the Drive Medical Poly Fly above with a few extra features like removable arms and adjustable foot rests. But the biggest difference is that it has a 300lb weight capacity. Like the Drive Medical Poly Fly above, this one has two wheel configurations. You can use it as a transport chair with small wheels. It is narrowest in this configuration. Or, you can pop on the larger wheels when you aren’t as concerned with the width. This allows the user to move it by themselves. So, if has a few extra features, why don’t I make it my top recommendation? Well, I have had more experience with the Drive model than I have the Medline model. Although, I will say, Medline makes a good wheelchair too. This model is also available in 18″ and 20″ seat widths. 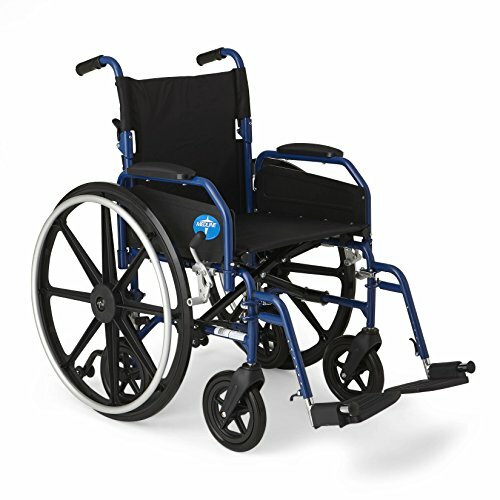 Check Out the Medline Hybrid Wheelchair at Amazon. Ultimately, it will come down to you to decide what would work best for you and your lifestyle. To find out how narrow your wheelchair has to be, measure the door openings of your home – with the door open! As long as the narrowest door is 22″ or more, you will be a-ok with any of these chairs. As a general rule, transport chairs are usually the narrowest wheelchairs. Anything less than 22″ is going to be tough. I haven’t been able to find any wheelchairs smaller than 22″ wide that would fit an adult. As a matter of fact, it is hard to find walkers that small except for Lumex who has a rollator that is only 20″ wide (learn about that model in this guide). Do you have any tips on how to navigate narrow doorways in a wheelchair? Have you seen a wheelchair small enough for really narrow doors? Please share below!